Lotus and Pie: Sunday Sessions - in the kitchen of course! Sunday Sessions - in the kitchen of course! Getting prepared for the week ahead. 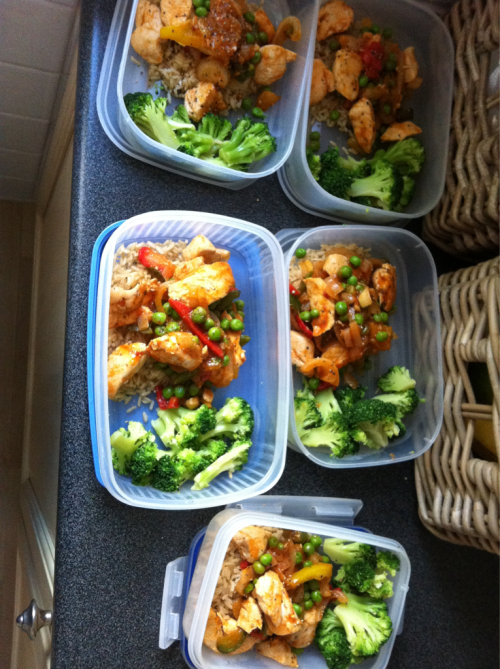 Chicken with stir fry sauce, broccoli, peppers, peas and brown rice. Nom nom. Not bad for 5 days lunch type meals. Other meals this week will consist of apple and cinnamon. Sweet potato home made fries. Yoghurt and honey. English muffins with seasoned egg whites and cheese. Oatmeal as per usual for breakfast.